Maree/Oranmore fc club sides kindly sponsored by The Galway Clinic have had a number of important games at all age levels over the past week. In an exciting Connacht Shield u18 semi final in Furbo against Bearna Na Forbacha Aontaithe last Sunday the Maree/Oranmore lads had to come back from two down to win 4-2 against excellent opposition in a very close game played in gale conditions. The excellent Alex Fearon got a brace with Diala and Shane Cox getting the other two. This was a very fine game with Barna Furbo certainly impressing and looking like championship contenders with the Maree/Oranmore lads putting in an excellent last 30 minutes. The Maree/Oranmore lads will play Castlrea Celtic in that final likely to be held in Sligo. The u18 Premier side had another fine win last Thursday in the Premier League in Drom against Salthill Devon. They won out with an emphatic 5-0 victory in a game which was much closer than the result suggests. Goals from Alan Greene(2) and Princewell Diala(3) secured victory and puts the team in a challenging position for the Premier League Title. 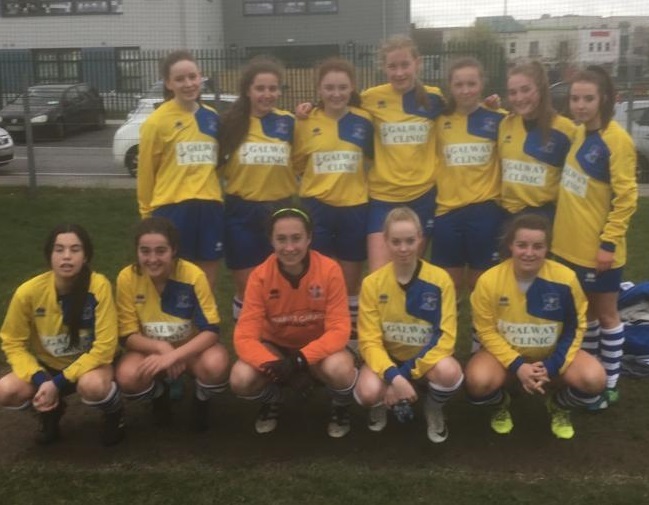 The u18 girls were also in action on Sunday last In Oranmore and came away with an invaluable League three points in a close 2-0 win against a brave Corrib Rangers outfit.The goals arrived from Rhiann Heery and Ruth Tansey. The u11c team had a fine away win against Knocknacarra fc in Cappagh park with goals courtesy of Shane Ramberg(2), Rory Leahy(2), Alan Burke(2), Symon Dulski and Shane O Toole(2). 42 u10 boys travelled in force last Saturday for the well organised St Josephs fc Tournament in Athlone. Our u12 group travelled to Brighton over the weekend with coaches and parents in a memorable trip organised superbly by Mike Quirke and David Watterson. Including training sessions and viewing Brighton and Hove Albion and playing Crawley Town in a packed schedule. The Finals/Celebration Day of our St Columbas c.u Invitational Tournament will be held on Sunday April 28th with fun for all the family.